Fast access requires a stable backbone. “Therefore most carriers in the region have a high demand for optical networking”, concluded Kollert. They couldn’t have chosen a better point in time, because new backbone technologies have to offer what the carrier long for. With today’s hot-button issues of 40G, OTH (Optical Transport Hierarchy) and dispersion tolerance, Siemens Communications shows how the balancing act between technology leadership and sensitivity to costs can be successfully performed. The reunion with an old acquaintance: 40G. The first functioning solutions for transporting 40 gigabit/s signals have been around since 2001. However, they were never used commercially, since the technical problems were regarded as too great, and then demand for high transmission capacities collapsed almost completely at the end of the telecommunications boom. But today the issue is back on the agenda, mainly for two reasons. First, new alternative modulation methods have put the technology through a maturing process in which costs were able to be cut sharply and technical problems overcome. Second, applications such as Triple Play Services, the still growing volume of Internet traffic, and large routers that demand 40G interfaces are sufficient incentive to think again about increasing bandwidth capacities in wide area networks, too. The latest 40G solution from Siemens Communication underscores the traditional technology leadership of Siemens Communications in this area, starting with the first 40G transmission in 1997 and leading to several world records (80 x 40G and 176 x 40G) in 1999 und 2000. What is special about the current 40G solution is that it can be used not only to build completely new networks, but can also be implemented on existing 10G infrastructures. To this end, a 40G transponder is installed in such a way that 40G signals are transmitted over the existing 10G infrastructure and all existing components do not have to be replaced or reconfigured. This option gives carriers several advantages. First, they ensure that their network is ready for the future. Second, this investment in a future-proof solution entails less cost than if a completely new 40G infrastructure were to be created. A successful field trial at AT&T and the world’s first commercial implementation of 40G technology at T-Com (Deutsche Telekom AG) demonstrate that these advantages are much more than theory – they have proven their marketability and suitability in practice. The second innovation in the field of optical network technology is that Siemens Communication already has the Next Generation WDM system SURPASS hiT 7500, a complete, marketable feature set for the new standard OTH (Optical Transport Hierarchy) defined by the ITU-T in recommendation G.709. The previously typical SDH technology tends to be geared to narrowband voice channels. OTH, by contrast, now offers a transmission technology that has been optimized for broadband data streams and can switch these streams between the electrical and optical level – regardless of whether the high bitrate data streams come from the Ethernet or SDH network. As a result, the basic condition for future convergent networks is met. Apart from the better suitability for carriers’ carrier services, OTH also simplifies network integration for carriers and interworking between optical network components from different vendors. That means that OTH now also offers the opportunity of defined interworking with set quality criteria for optical networks and, above all, the possibility of end-to-end performance monitoring with uniform parameters. As a result, binding service level agreements can be concluded and the processes behind them made end-to-end and transparent – something that precisely meets customers’ demands for lower OPEX (operational expenditures). Chromatic dispersion describes the expansion or aberration of a light signal as it passes through an optical fiber. 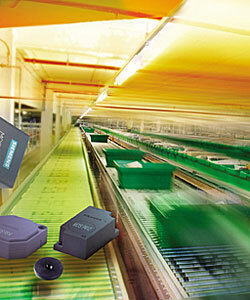 Siemens Communications has developed a transponder that takes care automatically care of signal distortions. Dr. Stefan Voll, Business Development DWDM Products, and Dr. Marc-Steffen Wrage , Product Line Management DWDM Products, explain why this technology is the international benchmark and how it helps cut carriers’ costs. Chromatic dispersion is a basic fact of life in optical networks. In addition to passive compensation by means of special glass fibers, transponders also compensate actively for dispersion. What makes the new transponder so? Marc-Steffen Wrage: Its most important feature is that the new technology works adaptively and in accordance with the MLSE principle (Maximum Likelihood Sequence Estimation). That means that, if conditions change over time, the transponder – unlike conventional solutions – automatically makes adjustments in keeping with the situation without the carrier having to take action. Stefan Voll: The transponder also has impressive performance since it can rectify more distortions – and any form of signal distortion at that – than has been possible to date. Well, those are the technological innovations. However, customer benefit alone determines whether a solution is successful in optical transmission technology as well, doesn’t it? Stefan Voll: That’s right, and the transponder displays its full strengths precisely when it comes to cutting costs. First, the adaptive method makes the network far more robust with respect to signal disruptions. The advantage of a more robust system is obvious: It necessarily means lower maintenance costs. Second, these transponders are far quicker and easier to install, since their software intelligence means they adapt automatically to a very wide range of circumstances in the network. And thanks to the simple plug-and-play principle, problem-free installation begins at the hardware level. That in turn entails lower personnel expenses and means that in future it will not only be proven, highly qualified experts who are able to install these transponders. Mark-Steffen Wrage: And last but not least, dispersion compensation, a significant hardware cost factor to date, does not have to be performed as accurately now thanks to the transponder’s increased tolerance. With the new transponder, we have truly succeeded in uniting our technology leadership with knowledge of customers’ real-world needs. We are now beginning to ship this new solution to our key accounts – just one more chapter in a long success story.